This mapping project captures the act of crossing a border, and the movement of the bodily experience doing so, rather than to re-define the border itself. This framework allows one to ask significant questions about the dividing line between territories: What does it mean to “cross” the border? What does it mean to corporealize the struggle of crossing the border? What is the emotional weight and memory that is carried as one leaves their “home” in search for another space to settle in an unfamiliar territory? What sense of belonging will I experience? 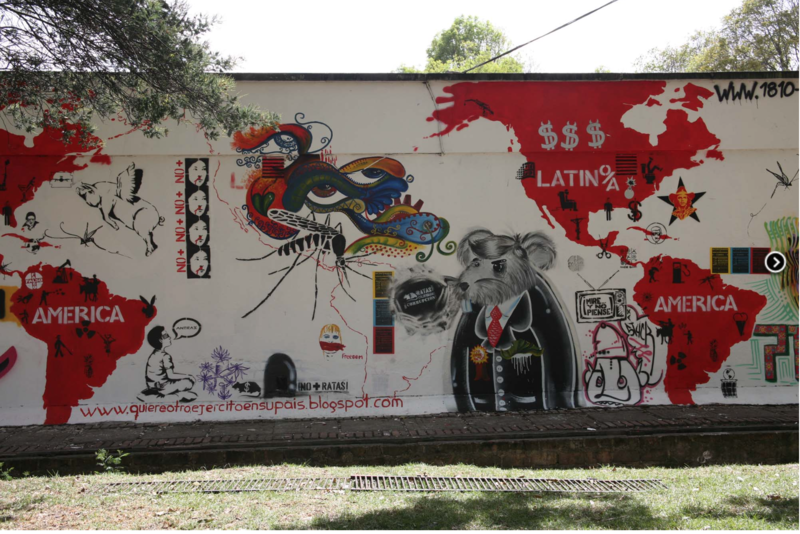 Since a border serves as a piece of geo-political infrastructure where bodies and materials intersect and collide, it therefore becomes important to explore the greater emotional and political territory of the line itself. Lasch brings this framework into mind as we think about how to visually map the social-relations embedded in the spaces perceived by the state through the act of “counter-mapping”. Lasch takes on this lens to focus on the emotional and experiential dimensions of “crossing” the border through the act of migration. Rather than looking at the border as ‘object’, Lasch captures the intimate experience of crossing the line. To go beyond the physical geographical line that separates one zone from another, Lasch uses an active working framework of “counter-mapping” itself to capture the on-going physical and mental struggles and experience of people moving across US-Mexico border. 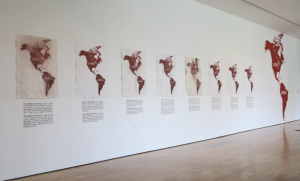 In order to do so, he gave the people he know who were about to cross the border a generic drawing of the geographical outline of North and South America as a means to capture the individual encounter before, at and after the border crossing. Each person he knew received two maps for their ongoing journey; one for them to keep and one for them to mail back to Lasch when the could/if they did. The maps that did make it back to Lasch were weathered, stained, ripped, dirtied and tattered with the routes and roots of different journeys over different periods of time. 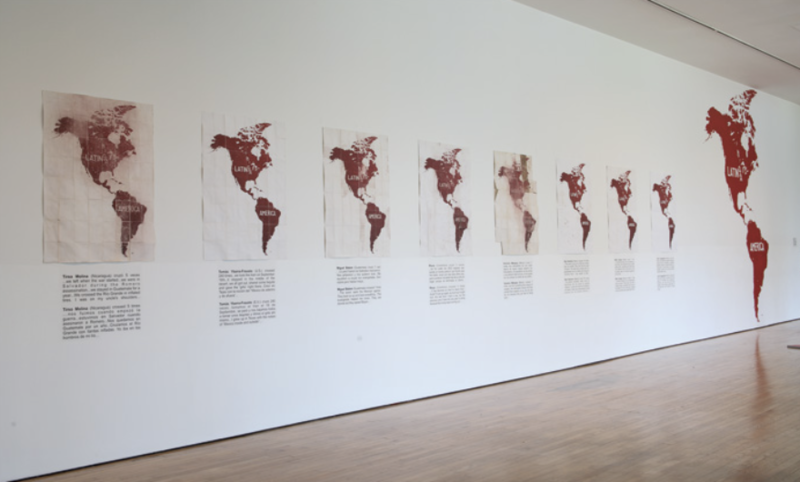 The rawness of these maps were transferred into an artistic and political series for the purpose of an exhibition. 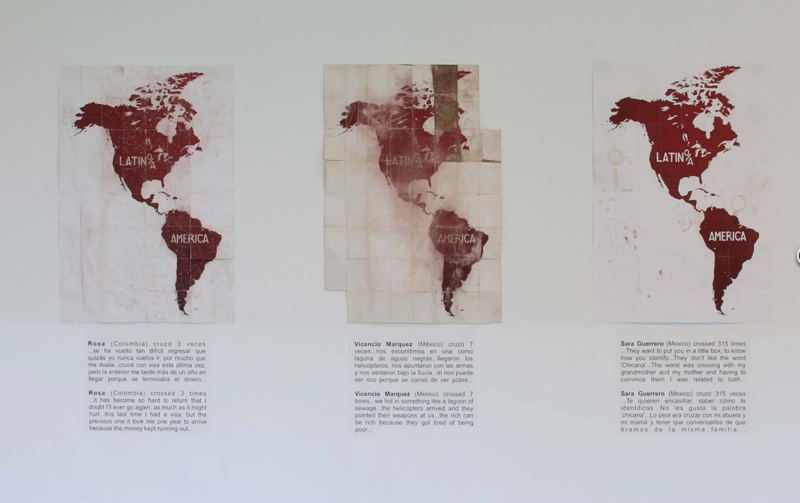 Individual maps on display were accompanied by visceral short paragraphs of border-crossing stories. Another visual power of this map is that it is simplistically static, while retaining the complexity of the political message. 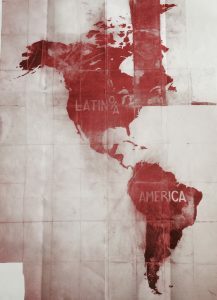 With the geographic boundaries shaded violent scales of red with two white words embedded in the colors, this map has been manipulated and used in multiple ways. 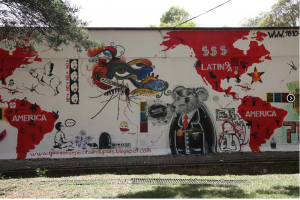 For one, it has been used as a mural in different spaces and places according to who commissioned it (see image below). Further, the map has appeared in many pamphlets, posters and unique publications, such as An Atlas of Radical Cartography. Certainly, Lasch’s theoretical framework of the border as an embodied experience across scales of time and space is one that opens up the visceral multitude of the border as active, rather than passive, and as a system that violently “plugs” people in into contained territorial spaces. At the same time, however, his map brings attention to how the micro-the “Latino/a” identity- can/does counteract the mega-structure. This map was significant for my term’s mapping project since I am situating it within a Latin American context too. My further critique of the map is that although it seeks to capture the violent dispossession of border-crossings through the experiences of Latino/Latinas, I do not think it gives a fair representation to the historical platform of the struggles in LA in order to understand the expanding identities of Latin Americans. Further, it is not clear what the historical context is in order for the viewer to be grounded in understanding the “Latino/Latina” identity. 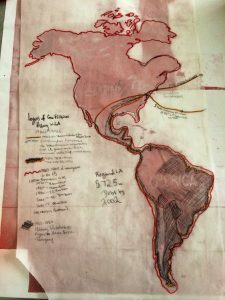 Thus, for one of my maps as I think about the development of my personal Atlas as a whole for this project, I would like to render layers of historical geopolitical policies and systems that have shaped Latin American identity vis-a-vis drawing powers of axis.